The number of political independents has continued to grow, as both parties have lost ground among the public. Based on surveys conducted this year, 38% describe themselves as independents, up from 32% in 2008 and 30% in 2004. Meanwhile, the percentage of self-described Democrats has fallen from 36% four years ago to 32% today. 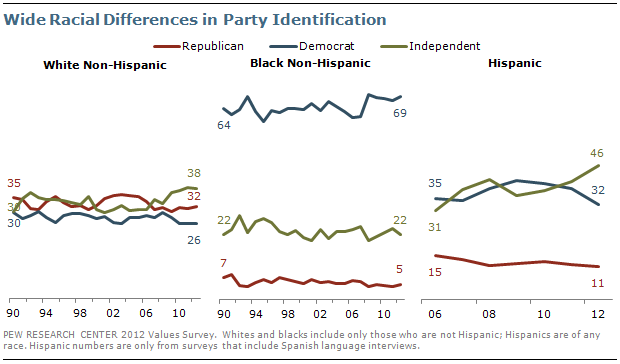 Republican identification has remained largely stable over this period (24% today, 25% in 2008). In 1991, however, there were nearly equal percentages of Republicans (31%), Democrats (31%) and independents (33%). The Democrats continue to hold an advantage in leaned party identification: In 2012 surveys, 48% either affiliate with the Democratic Party or lean Democratic while 40% either identify as Republicans or lean toward the GOP. That is little changed from recent years, but in 2008 the Democrats held a 15-point lead in leaned party affiliation (51% to 36%). As has been the case since 2008, a plurality of whites (38%) identify as independents. Among the remainder, more call themselves Republicans (32%) than Democrats (26%). Four years ago, party identification among whites was more evenly divided: 33% were independents, 30% Democrats and 31% Republicans. African Americans continue to overwhelmingly align with the Democratic Party (69%). But blacks’ identification as Democrats has declined since the mid-1980s; in 1984, nearly eight-in-ten African Americans (78%) said they were Democrats. By contrast, only about a third of Hispanics (32%) identify as Democrats while nearly half (46%) say they are independents; just 11% of Hispanics identify with the GOP. More than twice as many Hispanics either identify as Democrats or lean toward the Democratic Party as identify with the GOP or lean Republican (57% vs. 24%). The percentage of men identifying as independents is up sharply since 2008, from 35% to 43%. The share affiliating with the Democratic Party has fallen from 31% to 27%. About a quarter of men continue to identify with the GOP (27% in 2008, 25% today). Democrats maintain an advantage in party ID among women. Nearly four-in-ten women (37%) describe themselves as Democrats, compared with 33% who are independents and 24% who are Republicans. The share of women who call themselves independents has risen from 29% in 2008 to 33% this year, while the proportion of Democrats has declined (40% then, 37% today). 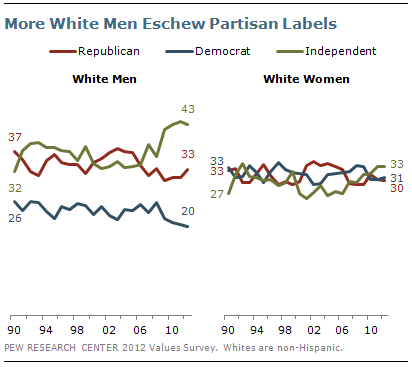 Nonetheless, there continues to be a gender gap in party identification. Women are more likely than men to identify as Democrats (37% vs. 27%). That gap has changed little in recent years. Men are more likely than women to identify as independents (43% vs. 33%). About the same percentages of women and men affiliate with the GOP (24%, 25% respectively). White men, in particular, are moving away from partisan labels. Currently, 43% of white men say they are independents, up from 36% in 2008 and 33% in 2004. However, the GOP continues to hold a sizable advantage among white men who identify with a party (33% Republican compared with 20% who identify as Democrats). White women, on the other hand, are more evenly divided: 31% are Democrats, 30% are Republicans and 33% identify as independents. Though these numbers have fluctuated only slightly since 2009, Democrats have lost some ground among white women since 2008 (34% to 31%), while the number of independents has grown (30% to 33%). The Republican Party has gained ground among white evangelical Christians in recent years. Currently, 49% of non-Hispanic white evangelicals say they are Republicans, up from 43% in 2009. The current figure nearly matches the 50% of white evangelicals who identified as Republicans in 2004 and 2005. 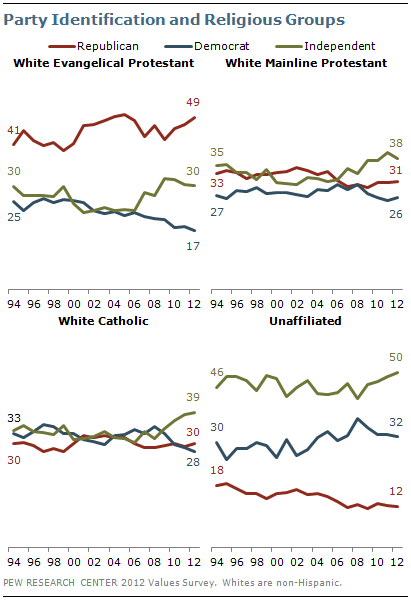 Pluralities of white Catholics (39%) and white mainline Protestants (38%) now identify as independents. In 2008, Democrats held a slight edge among white Catholics, while white mainline Protestants were divided in party affiliation (33% independent, 30% Democrat, 30% Republican). The share of the religiously unaffiliated who identify as independents also has increased. Fully half (50%) of those with no religious affiliation say they are independents, up from 43% in 2008. The share of the religiously unaffiliated who identify as Democrats has fallen over this period, from 37% to 32%. The percentage of Republicans has fluctuated a bit, but is unchanged from four years ago (12% in 2008 and 2012). The proportion of independents among the two youngest age cohorts – Millennials and Gen Xers – also has grown in recent years. 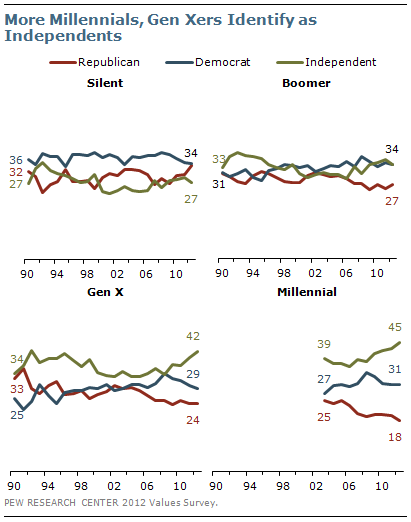 Meanwhile, the oldest age group – the Silent generation – is turning more Republican. Among Millennials, the youngest generational group (born 1981-1994), 45% say they are independents, a jump of six points since 2008. At the same time, the share of Millennials who identify as Democrats has dropped from a peak of 35% in the year Obama was elected to 31% today. There is a similar pattern among Gen Xers (born 1965-1980). Currently, 42% say they are independents, 29% are Democrats and 24% align with the GOP. In 2008, 34% each said they were independents or Democrats, while 25% said they were Republicans. The number of Baby Boomers (born 1946-1964) calling themselves independents has edged up as well – from 31% in 2008 to 34% this year. Currently, as many say they are independents as say they are Democrats. The number of Baby Boomers saying they identify as Democrats has edged down slightly from 36% in 2008 to 34%, while the number who say they are Republicans is unchanged from four years ago (27%). Despite electoral swings in recent elections, the fundamental ideological breakdown of the American public has shifted little in recent years. So far in 2012, 36% describe themselves as politically conservative, 22% say they are liberal and 37% say they are moderate. Throughout 2008, an average of 37% said they were conservative, 21% said they were liberal and 36% said they were moderate. 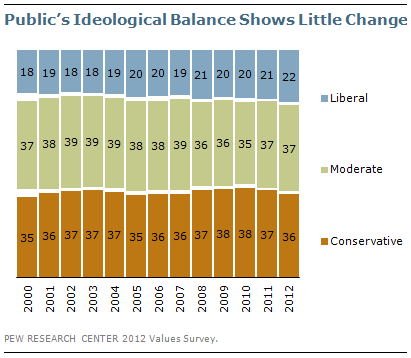 The breakdown in 2004 was only slightly different: 37% conservative, 19% liberal and 39% moderate. Looking at the breakdown of the adult population within the ideological spectrum of the parties – and among independents – also shows steadiness in recent years, but some longer term shifts. As the Republican Party has gotten smaller, it has become more conservative. Currently, 17% of the public identifies as conservative Republicans, while about half as many (8%) are moderates or liberals. That balance has changed little recently, but in the early 2000s there were more GOP moderates; in 2001 and 2002, 12% of the public identified as moderate or liberal Republicans. The balance of self-reported ideology among Democrats has remained stable in recent years, but also has shifted over the past decade. Currently, 12% of the public calls themselves liberal Democrats, 13% are moderate Democrats and 6% are conservatives. 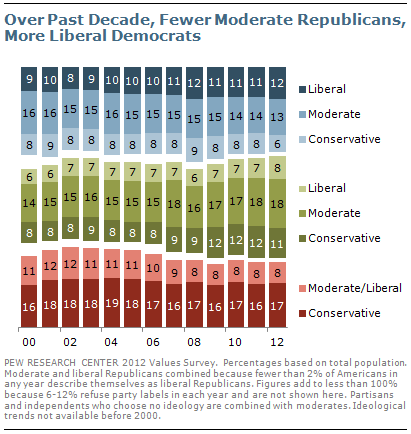 A decade ago, moderate Democrats outnumbered liberals by nearly two-to one (15% vs. 8%). As the number of independents has grown, the ranks of the independents include more moderates and conservatives. Currently, 18% are moderate independents, 11% are conservatives and 8% are liberals. Six years ago, 15% of the public was made up moderate independents, 8% conservative independents and 7% liberals. While both parties have lost adherents, they also are drawing more criticism from their bases. Just 28% of Republicans and Republican-leaning independents say the GOP is doing an excellent or good job in standing up for its traditional positions on issues such as reducing the size of government, cutting taxes and promoting conservative social values. Fully 71% say the party is doing a poor or only fair job in advocating its traditional positions. The proportion of Republicans and GOP leaners giving the party positive ratings has declined 12 points since November 2010, shortly after the Republicans’ sweeping victories in the midterm elections. 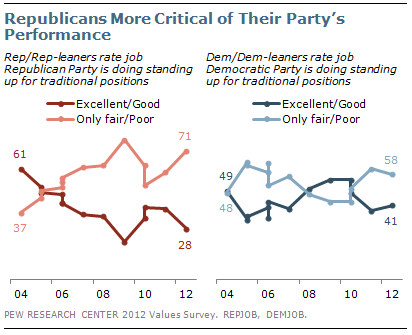 Since 2004, there has been only one occasion – April 2009 – when Republicans gave their party lower positive marks. 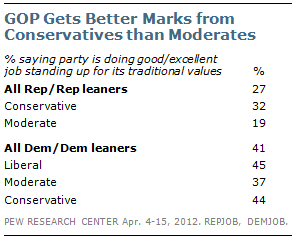 At that time, just 21% said the party was doing a good job in supporting traditional positions. More Democrats than Republicans give their party positive ratings for standing up for its traditional positions (41% vs. 28%). Still, Democrats are far less satisfied with the party today than they were in April 2009, during the early months of Obama’s presidency. At that time, a majority of Democrats and Democratic leaners (55%) said the party was doing an excellent or good job of standing up for traditional positions, such as protecting the interests of minorities, helping the poor and needy and representing working people. Within the ranks of Republicans and GOP-leaners, about a third of conservatives (32%) say the party has done an excellent or good job of standing up for its traditional positions, compared with just 19% of moderates. Among Democrats and Democratic leaners, nearly identical percentages of liberals (45%) and conservatives (44%) say the party has done well in advocating its traditional positions; somewhat fewer moderates agree (37%).